Tony Tasset, though born and raised in Cincinnati, has developed deep roots in Chicago and is a recognized artist in the Chicago art world and beyond. After Tasset moved to Chicago to earn his MFA at the School of the Art Institute of Chicago in 1986, he has been actively producing art for the city to enjoy. Chicago residents and tourists alike might remember some of his public sculptures, such as the giant, 30’ tall eyeball sculpture in the Loop, the colorful storage-container sculpture from Grant Park that was transferred to the University of Illinois at Chicago campus where the artist now teaches, or the giant sculpture of a deer on the city’s newly-renovated Riverwalk showcased just last year. As a multimedia artist, Tasset has worked in sculpture, photography, video, and film. Recently, one of his small multimedia sculptures made its way to The Center in need of care. 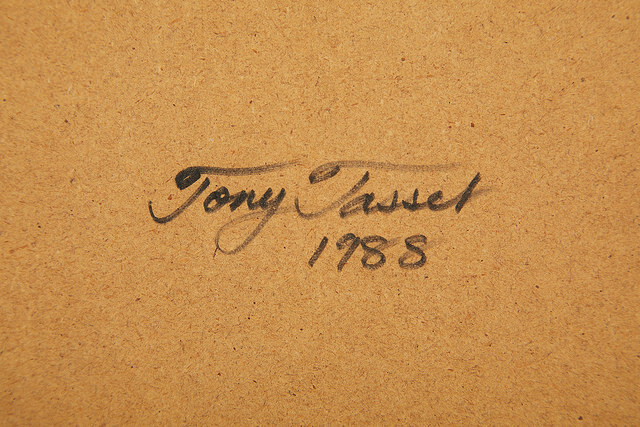 This artwork was signed and dated “1988”, and also included a small piece of paper indicating the work’s provenance taped to the verso. This piece of paper informed us that the piece was donated by the artist to The Chicago Art Dealers Association for their AIDS Art Auction, which ran at Chicago’s Museum of Contemporary Art from January 23-26, 1989. It also specifies that the work, “Untitled,” is comprised of mahogany, suede and Plexiglas, and is followed by the work’s dimensions- 17 x 14 1/2 x 5". 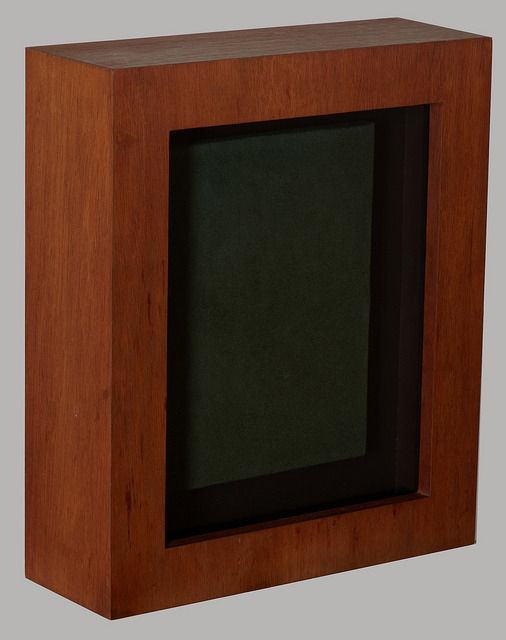 The mahogany veneered medium density fiberboard (MDF) of the sculpture has an oil finish, and the inside face of the box has a black polychrome surface. These surfaces, in addition to the Plexiglas, held a light layer of particulate film, due to age. The veneer was the most affected. Along the bottom edge of the sculpture, our conservators noticed evidence of water damage which may have contributed to an area of veneer discoloration approximately 3/4” high on the face. In addition, there was veneer loss of approximately 1 square-inch at the proper right bottom corner of the face, and another of approximately ¼ x 1” about 5 inches from the right corner. Both top face corners had loose veneer of around ½ square-inch and along the right proper side of the piece, there was an area of loose veneer 1 ½” long. The left proper back corner also had loose veneer about ¾ X ¼”. The inside of the piece was better protected, yet still not immune to damage: the lipping of the left inside edge was blistering 3” at the bottom corner and 2” at the top corner. Once the treatment proposal was accepted by our client, and the piece was photographed for in-house documentation before and after treatment, the next step was to thoroughly clean the artwork. Since the piece is composed of various materials, our conservators employed a variety of cleaning methods, each appropriate to its respective surface. The veneered areas and polychrome surface of the sculpture were cleaned with 5% tri-ammonium citrate. Conservators then treated the Plexiglas with an agent that cleans but also gives plastics and acrylics a lustrous shine. Finally, the suede was lightly vacuumed. After the piece received a thorough cleaning, it was time to treat the veneer. All loose areas were secured with rabbit skin glue, a conservation-grade adhesive widely used in art and furniture restoration. Patches of veneer that had suffered discoloration were treated with a solution of acid and water, then filled and inpainted to emulate the surrounding area. To inhibit damage to the mahogany in the future, the wood was covered in a protective Microcrystalline wax solution. The verso of the piece was adorned with newer and safer hanging hardware. The provenance sheet, original masking tape and all, was safely encapsulated. The work will also be included in The Center’s EXPO Chicago educational booth this year, thanks to permission from the client.